Marsaxlokk (/mɑrsɑʃˈlɔk/) is a traditional fishing village in the South Eastern Region of Malta, with a population of 3,534 as of March 2014. The village’s name comes from marsa, which means "port" and xlokk, which is the local name for south east. The word is related to the name for the dry sirocco wind that blows from the Sahara, comparable to the equivalent Catalan word, "xaloc". The village is known for the Marsaxlokk Market, a large market which takes place around the whole village on Sundays and tourist market all days during the week. The inhabitants of the village are called the Xlukkajri and are historically fishermen. It was in the "Golfo dello Scirocco" (Xlokk's bay) that the first Phoenicians landed and set up trading posts on Malta, during the ninth century BC. During the Great Siege of Malta, Marsaxlokk Harbour was also used as an anchorage by the Ottoman fleet. The present-day population of Marsaxlokk is around 4,000. In the past, a great percentage of the population worked as full-time fishermen. Most of Malta's fish supplies are caught by fishermen coming from this port. Swordfish, tuna, and the popular 'lampuki' are caught in abundance between spring and late autumn. On weekdays, the catch is taken to the fish-market in Valletta, but on Sundays fish is retailed by fishermen in the open on the quay. Fish restaurants have opened to meet the ever-increasing demand. 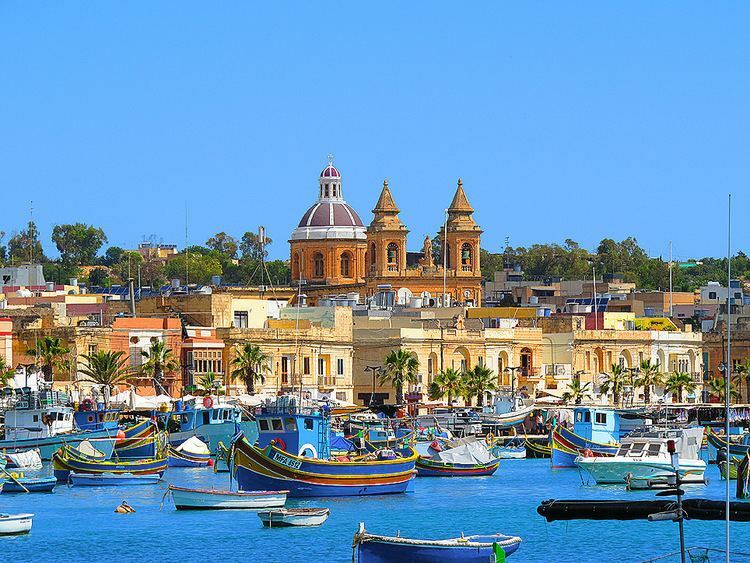 The tourist influx to Marsaxlokk has also attracted many hawkers and souvenir vendors, which are known to have been the first to have contributed for having such a great local tourist industry. Marsaxlokk is about 40 minutes from Valletta by public bus No. 81 or No. 85. The village is approached via a long, narrow, straight, road with vineyards on both sides, or along the coast from Birzebbuga if traveling on the No. 85. The bay is at the south-east end of the island and is memorable for the many colourful, traditional fishing boats called luzzu . The painted eyes on these luzzus are believed to protect the boats from danger. Tourists visit the town for the picturesque photo opportunities of the bay filled with colourful fishing boats, plethora of seafood restaurants and the very busy Sunday market that sells everything from fish, fruit and vegetables, delicatessen goods and groceries, to souvenirs, clothing and footwear. Another attraction is the nearby, spectacular, Saint Peters Pool. This is a swimming area with crystal clear, deep blue water behind the Delamara Power Station. It is not advisable to visit when the wind is from the South or East however, as the water can become cloudy and sometimes, rough. Once here, after making it to the souvenir market, one can eat a fish dish or make it to St. Peters Pool, one of the nicest places to swim. Yet, not appropriate for the young ones. however, along the fishing village there are still plenty of places where one can swim. Either sandy or rocky beach. Marsaxlokk F.C., formed in 1949, is the village's main football team. It plays in the Maltese 3rd Division, with home games taking place at the Ta' Qali Stadium. Marsaxlokk also has a water polo team which dates to 1952.